The Beal Stinger III 9.4mm UNICORE Dry Cover is a single rope with UNICORE technology and a Dry Cover treatment for increased durability, designed for high-level sport climbing. The Beal Stinger III 9.4mm UNICORE Dry Cover uses UNICORE technology to eliminate sheath slippage and fraying, vastly improving its safety and meaning the rope will still function if cut or torn. Its Dry Cover treatment adds general durability, protecting the rope from water and abrasions and lengthening its lifespan. A great lightweight crag rope with a decent fall rating. In non-UNICORE ropes, the sheath and the core, even though they are tightly woven together, are independent from one another, which leads to sheath slippage and effectively reducing the longevity and overall safe use of the rope. UNICORE ropes bond the core and sheath - i.e., UNICORE. This eliminates sheath slippage, prevents the rope from fraying if it is cut or torn and thus allows it to still pass through belay devices and carabiners etc., whilst also reducing water shrinkage by more than 50%. 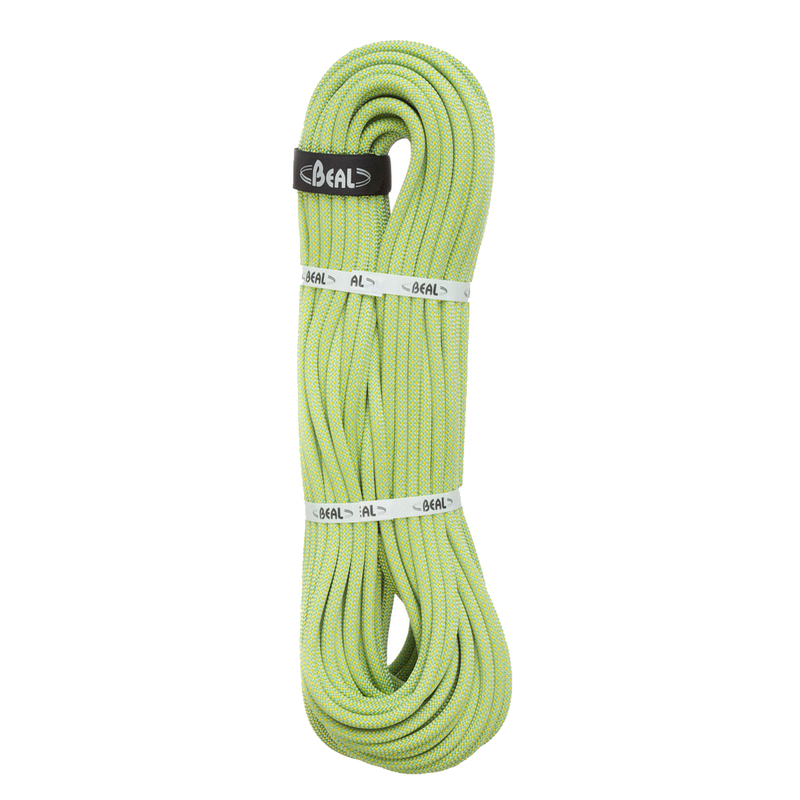 Comes as standard on all of Beal’s dynamic ropes. A treatment on the rope’s sheath that protects it from moisture and increases its abrasion-resistance, helping the rope stay dry and overall lengthening its lifespan. Found it spectacular nice colored, extremely smooth to handle and very light to carry! In love with my Pink Fuschia rope! Perfect length and diameter for both indoor and outdoor sport climbing! A little stiff at first, but once used a few times it becomes softer and smoother! Recommend! We ordered the rope in the color Fuschia which is an eyecatcher for sure. It is very pink but I like it. While using it for the first time it was twisting quite a lot. After that all was fine and its fun to climb with this rope. it glides nice and easy through your hand and the quickdraws when you take rope for clipping. So far we used the rope with ATC and GriGri. ATC works fine but since it is rather thin, you have to hold on tighter when your partner needs a break in the wall. The use with a GriGri is really good. Automatic break in the GriGri works as its supposed to work and lowering goes smooth. The catch after a fall didn't feel too hard but of course that also depends on the belayer. Also nice that the rope comes with a mark in the middle, which is an important feature for me. So yes, I recommend the rope. I am very happy with the rope, because it allows excellent handling and is it easy to make knots. It is quality and after two months it is not visible traces of use. I recommend buying. Excellent rope, great endurance and flexibility. This is the second one I bought, the last in use from a year ( two times a week as mean usage) and still in optimal conditions. After 10 days of climbing I had to cut off 1,5 m because of used cover and core of the rope looked damaged. The rope ends used randomly and both after few days of climbing in Spain qualified to cut off the first 1m part. Good rope because is light but next time I will buy rather heavier rope like 9.8mm which last longer.